We have reviewed a number of different vaporizers over the years, and there has been a wide range of build qualities, functions, and inclusions. 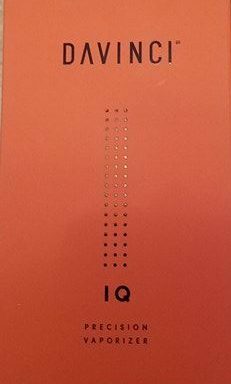 While the DaVinci Ascent was one of our favorites a few years back, we just received the company’s latest product, the IQ. The ability to have a replaceable battery (the IQ uses the 18650) is not a function that we have previously seen, but DaVinci’s desire to increase the customization of their device is unparalleled. The different temperatures at which one can place the IQ at speaks to the different breakdowns in plant material. By moving away from the one size fits all approach, DaVinci has specifically addressed one of our key issues with vaporizers as a whole. With all of the discussion of IoT devices, vaporizers generally have seemed a bit behind the times. DaVinci has crafted their own mobile application that ties the device to the owner’s DaVinci account, as well as allowing owners to turn on their IQ from a remote location. The overall size of the device allows it to fit comfortably in one’s hand without being too heavy (5 ounces). One’s preparation time with the IQ is pretty low, as well – one should be able to partake around 15-20 seconds after the vaporizer is turned on. With a 10 year warranty, the DaVinci IQ should be considered as a must-buy holiday or birthday gift for anyone that is fan of vaporization or wishes to move away from combustion. The IQ Vaporizer is available from the DaVinci website for $274.99 and comes in three colors. Our biggest recommendation for the DaVinci IQ would be to purchase a few additional batteries and keep cycling them out whenever the device runs out of juice. The quick recharge time should mean that this is a rare occurrence, but with the low cost of these batteries, one should be prepared.